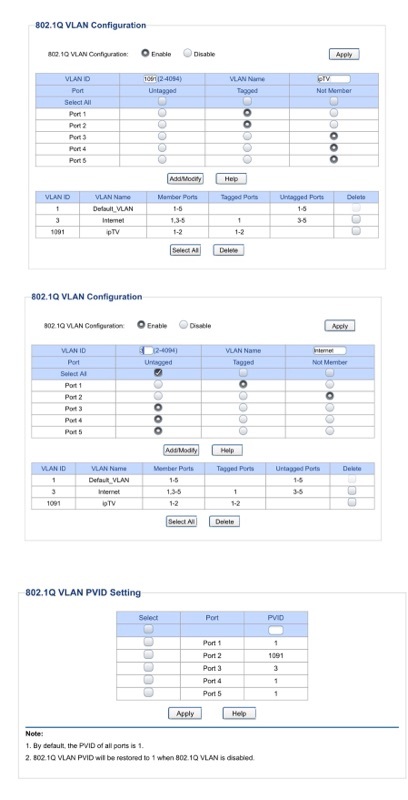 Assuming (I) I connect the two smart switches via a trunking line on Port 1 for both switches A&B, then (ii) tag Ports 2,3, 4 and 5 of Smart Switch B to each be part of both vlan 1091 and vlan (internet), technically each of Ports 2,3,4 and 5 will carry packets from both Vlan 1091 and vlan (internet). What will happen if I connect the Fibre Set-Top box or a computer to any of Port 2,3,4,5? Will any of the devices work? Or both Fibre Set-top box and Computer won't work because they are not able to decipher/manage the dual networks on each port? If ports 2,3,4,5 are tagged 1091, you should only connect iptv devices. Otherwise configure the ports on the switch as shown below.